If you’re using built-in tags feature added in WordPress 2.3 or later, there is now more and more choice of plugins that add tags management functionality essential to manage and tidy up the tags added to the WordPress database, thanks to lack of such interface packaged, or at least not yet up to WordPress version 2.3.1. Other than Tag Management Things, Advanced Tag Entry and Click Tags, there is also Recommended Tags for WordPress. Recommended Tags plug-in for WordPress 2.3+ has a unique feature compared with other tag management plugins, that Recommended Tags able to utilize the built-in tag system for recommending and displaying a list of your current tags, and thus voiding the issue of creating duplicate tag names that are nearly identical, such as “download” and “downloads,” and use of AJAX technology to provide tags auto completion. Type-ahead tag completion will show a list of matching tags as you type them in the box, with the total number of times a tag has been used shown in parenthesis immediately after the tag name. 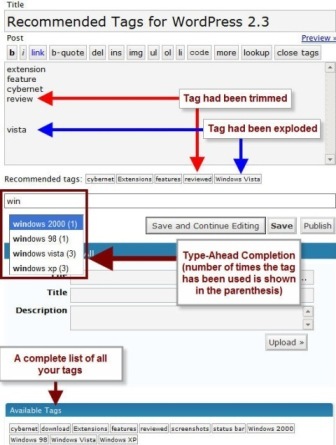 Intelligently recommended tags based on the content of the article, where tag name can be ‘exploded’ to match individual words, able to specify words to ignore, common plural/past endings can be trimmed off and HTML tags are excluded. Complete list of all existing tags is shown below the upload box in case a desired tag is not recommended. Completely customizable via the WordPress Admin screen. Recommended Tags unique features make it stand out among many other tags management plugins for WordPress 2.3+. However, beware of degradation to database performance while writing new post as the number of the tags in the blog increases. Note that Recommended Tags version 2.00 supports only WordPress 2.7.x and version 1.7 supports only WordPress 2.5 and WordPress 2.6, and version 1.48 only works with WordPress 2.3.x. Older versions, and all help and support on the plugin available Cybernet News.